It must be difficult trying to work with a toddler doing her best to help but actually I quite often start designing with something in mind but it takes on a new life half way through and ends up being something else and I have no excuse. Wow, that’s a wonderful blog post and so interesting! The finished pieces even with a bit of unintended help from your toddler came beautiful and so creative! Great job to both of you! 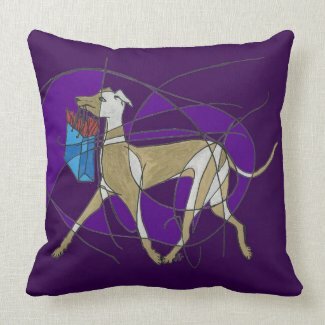 I love the Gone Shopping Italian Greyhound throw pillow! The results are fabulous! Love the pillow! I am quite impressed on the talents of both of you! What a lovely post. I very much enjoyed reading it with my morning coffee and I love how you have run with your daughter’s input in your art. The pillow that youve shown at the end of the post is beautiful.